On a cool September evening in Houston, TX, 1973, 29-year old Billie Jean King played what many consider the most important tennis match of her career. Was it for a World Championship? No. Was it for a record-breaking Grand Slam Tennis title? No. Would this match go on to be the cornerstone of a social movement for women sports equality? Yes. In the year 1973, Americans were dealing with several non-sports related issues; Watergate, inflation, and the energy crisis to name a few. And thanks to several feminist activists, Billie Jean King being one of them, the country was about to finally see a Woman's Movement as well. 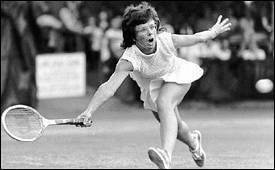 On September 29, 1973 at the Houston Astrodome, 49 MILLION Americans turned on their television to watch the 12-Time Grand Slam Champion Billie Jean King play retired but former #1 player in the world, Bobby Riggs. It was a Battle of the Sexes tennis match that an unusually high amount of Americans opted to watch that night (tennis still is not the most media-covered sport of interest in America). "I thought it would set us back 50 years if I didn't win that match," King is quoted saying after the match was over. "It would ruin the women's tour and affect all women's self esteem." The Women's Tennis Tour, which King had help start only 5 years prior, was still gaining momentum and enough popularity to stay intact for women's professional tennis players. It was important that King accept Riggs' challenge in the Battle of the Sexes match, to show that women can literally compete with men in this sport. And fiercely compete she did. After claiming her Victory quickly over Riggs in this historic match, not only did millions of Americans witness a woman dominating a man single handedly in a sport, but they got to witness the power of one American heroine rise above in a time of political scandal, social reformation, and economic turmoil to draw American back together for the love of sport. This summer, The Billie King Tennis Center, home of the annual US Open Grand Slam tennis tournament, will add 3,000 additional seats in time for the tournament. King's accomplishments off the court in her retirement include being the Founder of the Women's Tennis Association, the Women's Sports Foundation, and World Team Tennis. We at Aries Apparel are proud to consider ourselves a part of the ripple effect that occurred when Billie Jean King swung onto the tennis scene over fifty years ago. Women's activists such as her have helped cultivate a society today that is not only warm and receptive, but truly enthusiastic about a unique and specialized stores such as ours, where that wouldn't have been the case 50, 30, or even 15 years ago. I'm sure Billy Jean King had no idea of the lasting impact her extraordinary efforts would have in arena of female athletes and the businesses that support them. Thank you, Billy Jean!